Mayor Jim Watson, Ward Councillor Steve Desroches and Councillor Mathieu Fleury presented the Mayor’s City Builder Award to Mr. John Therien for his many years of dedication to making Vanier a healthy, safe and prosperous community. 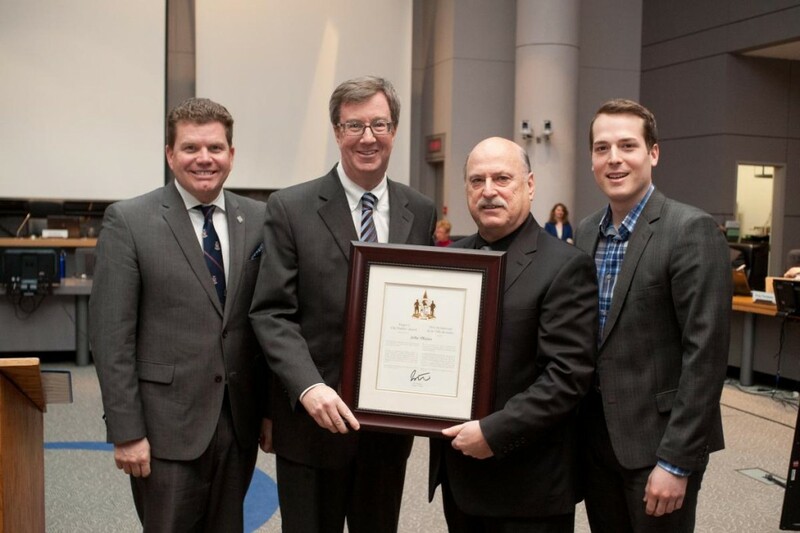 Mr. Therien served as Chair of the Quartier Vanier BIA for eight years, where he led an engaged group of business owners through a period of unprecedented growth and change in their community. Under his leadership, the BIA helped many local charitable causes including a women’s shelter, several church projects, school projects, the Knights of Columbus and a Christmas toy drive. He has been the owner and head instructor of Therien Jiu-Jitsu and Kickboxing for 42 years, which operates eight dojos including one on Selkirk Street in Vanier. He has introduced thousands of young people across Ottawa to the discipline and healthy physical activity of the martial arts.